Fried okra is my all-time favorite vegetable. It is the only green vegetable that I get excited about eating. I can eat a ton of it. I prefer to make it at home as opposed to eating it out. Most restaurants just fry frozen okra. It has the stems and tips in it, and I hate when I accidentally eat those pieces. Yuck! I like to buy the small okra pods and slice it fairly thin. Most of the time I just slice it and toss it in corn meal. This time I decided to soak the okra in buttermilk and then toss it in corn meal. It was like little cornbread nuggets with yummy okra inside. It was absolutely delicious! Rinse okra and slice. Discard stems and tips. Pour buttermilk over sliced okra; cover and chill 30 minutes. Remove okra from buttermilk. Dredge okra in cornmeal. Pour oil to a depth of 2 inches in a Dutch oven or large skillet. Heat oil to 375ºF. Fry okra in batches until golden brown, about 4 minutes. While I do consider myself a true southerner I've never made fried okra! Please don't revoke my southern rights! I've got to get to cooking these little babies up stat! I hope you don't mind, I shared your website on my blog this week. As a kid, you couldn't have paid me enough to eat okra. As an adult, I can't get enough! I've never made it myself, but this looks simple - I'm going to give it a try. Thanks! OH MY WORD.... I just told mom she needs to bring me some okra soon. I'm craving it now. They have a garden and it's the one thing I haven't had this summer from it! I grew up eating fried okra. This is not my mother's fried okra. She did not cover hers with cornmeal. But I do eat these when I find them at restaurants. Now a fried green tomato is different. It needs some cornmeal on it to taste right. My mom made some really good fried green tomatoes. I miss her and them. this is not how i make fried okra, either. i do use cornmeal, but i do not use buttermilk. fried green tomatoes are the best. dip in cornmeal, fry in bacon grease, yummy no matter how bad for you! I am soooo happy that you posted this! 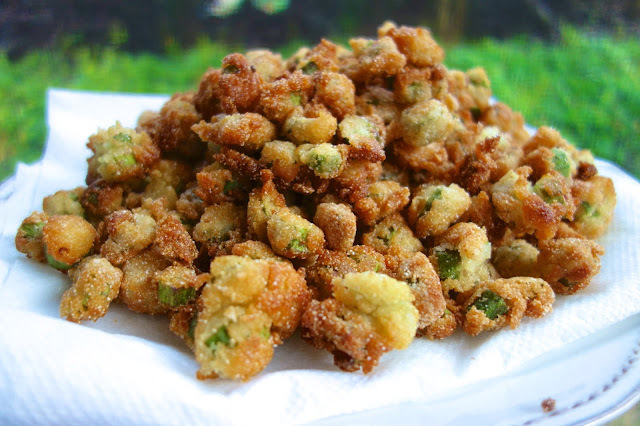 I am absolutely LOVE fried okra and this will be on my menu sometime this week! I love fried okra so much that we are growing it in our garden for the second year in a row. We likes ours dipped in a little bit of ranch dressing. Thanks for sharing your recipe. I always make mine using an egg dip and then dipping it in a seasoned flour mixture. Your way looks so much easier and less messy that I'm for sure going to be trying it once we start harvesting some. You speak my foodie language, woman. 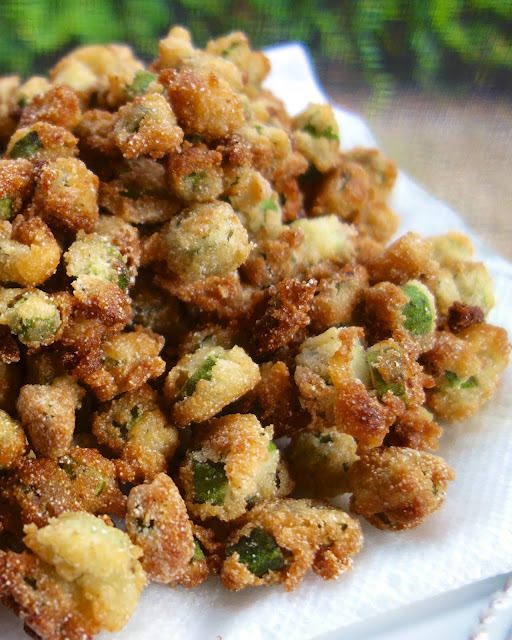 I love fried okra, my Mother fixed it often when I was growing up. My question is for those times when fresh is not available, which seems to be often here in Northern Illinois, will frozen okra give desired results? Not the frozen breaded variety, just plain frozen okra. Yes, the frozen okra does fine.. I too love fried okra and I use thawed frozen it's all cut up and easy. I think is tastes terrific. I don't think there is ever enough fried okra! You just can't quit eating the stuff. People who are not from the south cannot quite figure out just why we southerns like it so much. We can't either but we know we love it! I might have to give the buttermilk a try. I'm like you, I usually just coat it with corn meal. But I am wondering ... what's wrong with the tips? I understand not wanting the stem, but the tips!? my family always split the okra lengthwise. The tops were discarded, but they ate the tips. So, I keep them. We never used buttermilk, just corm meal. But, my hubby, who was not born a southerner but has lived in Texas for 43 years, likes it dipped in buttermilk and with flour and cornmeal mixture. I guess it is a matter of taste. I have such a lady crush on you now. My mother was from Arkansas and she fried Okra in the summer. It was such a treat! You can get it frozen battered, but it isn't as good as what she made. She just tossed the cut Okra in cornmeal and fried it.YUM! I'm from many generations of okra lovers. My family always sliced it, soaked it in salt water until the water was slimy, and then rolled in flour to fry. I love it whether cooked with flour or cornmeal and whether it is fresh or frozen. My favorite meal is fried okra, fresh home-grown tomatos, and corn on the cob dripping with butter! Now that is a southern meal for vegetarians!! West coast gal here. Does the cornmeal/buttermilk cut the slime factor? I love okra, but any little bit of slime and I'm off my feed immediately. I see Judy soaks hers in salt water. Does that reduce the slime? Help me out here, I want to eat more okra but I struggle with the slime! This okra wasn't slimy. Enjoy! same way I fry mine..only I cant get the fresh okra fear round, so as you can guess--have to use frozen(only after I pick out the ends and tips)but fresh is always better--always make extra large batch--the wife also likes it cold. When we had a garden, sometimes I would fry okra, squash together when there wasn't enough of one vegetable. I've even thrown in a chunked green tomato and potato.